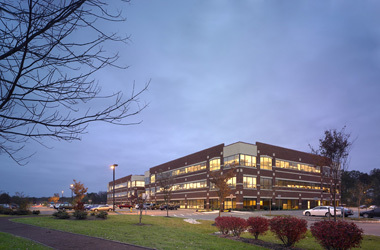 The new three-story, 120,000 square foot building for AAA’s Mid-Atlantic call center in Hamilton, New Jersey is the primary call center for road-side assistance in AAA’s northern region. The new facility included the interior fit-out of offices, computer server rooms, kitchen/vending area, cafeteria and fitness center. Hatzel & Buehler’s scope of work included all of the electrical installations associated with the tenant fit-out for the new call center. Two items critical to AAA’s operations – the 150kVA UPS and the sound masking system – were furnished and installed by Hatzel & Buehler.